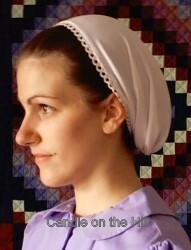 When Alicia of Plain-n-Simple Headcoverings in Missouri asked for a traditional snood pattern, we came up with this cozy design. Quickly popular, it is now available to the home-sewer! 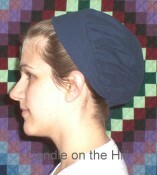 Lined brim curves around the head and meets at a small elastic gather at the nape of neck. Full crown is gathered, or tucked, to brim. Wear your hair pinned up or down within the snood. This pattern now also includes a child size!! Plus information for adjusting for a better, personal fit! 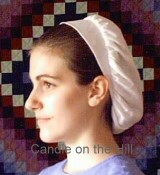 This covering is available ready-made from Plain-n-Simple Headcoverings.